All lit up for another night of marriage. Last night I was struggling–as I struggle every night–to turn off my bedroom light. It’s a fancy, newfangled thing that provides ample frustration for me each evening as I try to go to bed. 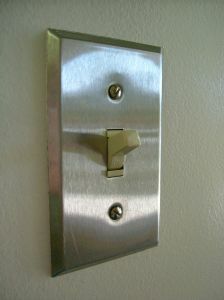 Gone, it would seem, are the days of the blessedly simple light switch; can you even remember what that was? Oh, to be a child of the ‘80s, when you could walk into a room and, without a thought in your head, throw your finger on the switch and flick up for light, down for dark. Life was simple, and we lived it within two phosphorescent categories: light or dark. No shades of gray. Today, things are different. The world of illumination has evolved from a two-act play to a six night miniseries, special effects included. Now, when I walk into a room, I’ve got some decisions to make. Do I want full light, reading light, warm dusk or evening glow? I need to quickly decide so I can determine how long to hold the push-bar thingy (I think it’s called a dimmer?) down. What I really want is to just flick it off without stopping as I walk to my bed, but my Fancy Dimmer won’t allow it. No, I have to pause between brushing my teeth and fluffing my pillow to ascertain my lighting needs for the next twenty minutes. Will I be reading, chatting with my husband, working on my laptop, or sleeping? The lighting level must correspond with the prescribed activity, and it must be selected pronto, before I pass by that dimmer and get into bed only to find myself saddled with Reading Light when what I really needed was Evening Glow. Should that happen, the gruesome penalty will be heaving myself out of bed and across the room for yet another harrowing round with the dimmer. Ain’t nobody got time for that. I want to just flick the light off, but my Fancy Dimmer won’t allow it. And so we arrive at Last Night and the hardships found therein. My husband was already in bed and asked me to turn out the light. (Hmph. Coward.) I pushed the dimmer and nothing happened. I pushed it again: nada. “I have set the light level–like a million times! It just doesn’t work.” A muffled moan came from under the covers, where my husband was hiding his eyes from the Full Light that now drenched the room. “See?” I was kind of night-shouting now. “I told you! I pushed it and it didn’t work!” He sighed and threw the covers off his face, defeated. “I am not impatient! I just don’t like waiting for it to fade out.” He was silent for a moment, perhaps deciding whether to point out that someone who “doesn’t like waiting” is, by definition, impatient. He refrained. On this mature note, I surrendered my efforts and huffed into bed, where we closed out our day together beneath the yellow stain of Evening Glow. I never did get the light to fade out completely, and I wasn’t about to give my husband the satisfaction of watching me get back out of bed to try. So the light remained as was–dim, but not dark. The Hub can sleep through anything, so while I lay on my back, arms folded and eyes squinting against the glare, he was already in an envious doze. I, on the other hand, would lie awake for eight straight hours if Evening Glow were left on all night. I waved a silent hand back and forth over Sleeping Beauty’s face; he was out cold. Freed from his censure, I rolled gently to my side and rose to fix the light. Padding softly over to the dimmer, I began to silently operate it in the manner he’d instructed. My efforts failed as the light only grew brighter. Oh no–no, no, no!–what if it woke him up? I’d never hear the end of it. I punched the bottom half of the dimmer, faster and harder, with the panicked pad of my thumb. “Come on,” I breathed, “turn off…turn off!” My muttering grew to a stage whisper and my frenzied thumb was now leaving an audible thud in its wake. The room was at Full Light now and there was, quite simply, not a thing I could do about it. My hand fell and my shoulders slumped as I heard the rumbling giant flop over and sit up. “I’m just turning off the light. What are you doing?” I stood dignified, albeit aimlessly, by the wall. “What? Well then, turn it off…please…” He flopped back down and, to my great relief, the lecture was spared. “Okay, just a sec…” I now realized that to save face, my only option was to do nothing. So I wandered into the adjoining bathroom, closed the door quietly, and stayed there for awhile. After fifteen minutes spent clipping my toenails, filing my fingernails, and applying the Roc cream that’s supposed to take ten years off my face, I sauntered casually back to the bedroom where the light had, at long last, been turned completely off. My husband must have finally given up, gotten up, and fixed up that whole lighting mess. I eased myself into bed and sighed with contentment as I pulled the blankets to my chin. I may have lost the battle on competency, but I’d won the war on craftiness. A good marriage, I thought with satisfaction, is all about complementing each other. And with that ideal met, I drifted off to sleep under the beautiful darkness of a correctly set dimmer. Sisters by chance, enemies by choice. Next Article The Memory Maker’s Meltdown.